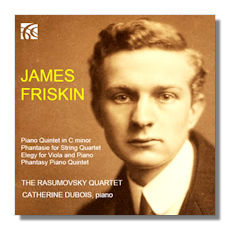 Born in Glasgow in 1886, James Friskin is one of those under-rated 20th-century British composers who deserves much more recognition. He was a precocious kid, and as early as age 14, his talent as composer and pianist resulted in his being admitted to the Royal College of Music after a scholarship award. He furthered his studies in composition with Sir Charles Villers Stanford, the outstanding professor of the day, an experience that widened his interests in European music and helped him transcend the insular traditions of English music in the Victorian era. The best known British composers of his age all benefited from his teaching abilities and fiery criticism, and he was held in high esteem by many an eminent musician such as pianist Myra Hess and conductor Frank Damrosch. Indeed, it was the latter who invited the 28 year-old Friskin to become a founding teacher at the Institute of Musical Art in New York, a post that was to become the foundation of a successful American career. After almost 43 years of indefatigable toil dedicated to teaching and performing, Friskin died in his beloved New York in March 1967 aged 81. Unfortunately, due to his vast number of commitments, Friskin composed precious little during his American years. Consequently, his output consists mainly of those works he wrote before 1914, and the four pieces on this disc are only separated by a five-year span (1907-1912). The 1907 Piano Quintet combines enthusiasm and big emotions with a profound grasp of extended musical form and idiomatic writing, and at almost 37 minutes it is the most substantial piece on the programme. No mean feat for a 21 year-old. The Phantasie for String Quartet was written two years later when Friskin decided to enter a competition for new chamber works set up by Walter Cobbett in 1905. The work is in one movement divided in three distinct sections: a jovial and graceful beginning, a romantic middle "poco adagio", and a crisp and impassioned ending in march-like tempo. The 1912 Elegy might have been written with Rebecca Clarke in mind. Rebecca was Friskin's lifelong love, but they only married when they were both 58. At the time of its composition, Friskin's love was not returned so the piece expresses most vividly not only his strong feelings for Rebecca, but also his frustrations that the intensity of his emotions was left in the lurch. The 1910 Phantasy for Piano Quintet is also in one episode movement, but although its length is only half as long as the Quintet, it is filled with incident and contrast, making it a most attractive piece where the constant change of tempi gave Friskin a great opportunity to experiment. Performances have a purity of tone that is absolutely remarkable and the sympathetic playing serves Friskin's vigorous writing with wholehearted involvement. This is off-the-beaten track stuff that satisfies and delights. Notes and sound are excellent.